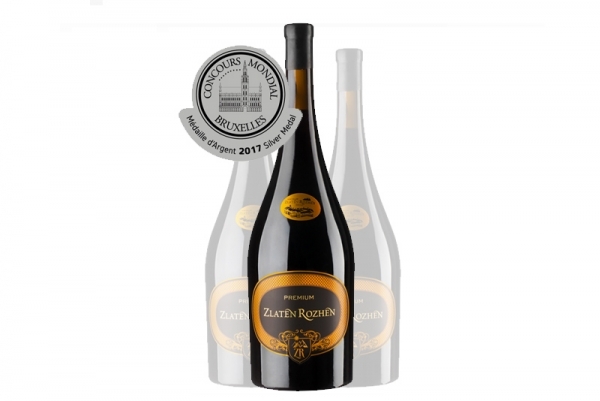 The premium blend Melnishki kupazh of the ZLATEN ROZHEN winery was awarded with a silver medal this year on the most prestigious independent wine competition in the world – Concours Mondial de Bruxelles 2017 in Valladolid, Spain. The award that Melnishki kupazh won was in the category “red wines”. The recognition was special and long anticipated by the winery which participated in the completion Mondial de Bruxelles for the second time in a row with its tasting samples. On the previous edition of the competition in 2016 professionals from all over the world had the chance to taste qualitative Bulgarian wine at place in Bulgaria. Our country had the amazing opportunity to be a host of the event. Melnishki kupazh of ZLATEN ROZHEN was competing with strong opponents with as much as 57 more remarkable Bulgarian wines. The award is an amazing accomplishment for the winery and without a doubt is proof for high quality for the kupazh premium wine which convinced the jury with its maturity and perfectly balanced combination of the typical qualities that Melnishki Rubin, Melnik 55 and Cabernet Sauvignon have. The Mondial is the most prestigious independent wine competition in the world, the only one touring in Europe by assembling at one place worldwide wine elite representatives, sommeliers, members of the wine vineyard associations, traders from specialized shops and big chain stores from all over the world. During the Concours Mondial 2017 in Valladolid were competing 9080 wines from 50 countries.